New Berlin, NY (WBNG Binghamton) After his wife went missing seven weeks ago, Ganesh "Remy" Ramsaran broke his silence and wept for her return. For the first time, her 37-year-old husband Ganesh Ramsaran spoke to the media about his wife's disappearance. "There are days where I have hope," Ramsaran said. "And then there are days exactly the opposite." Ganesh Ramsaran said he has spent nearly two months on little sleep wondering where his wife could have gone. "You think about the worst, you think about other possibilities, you just don't know" he said. "The not knowing is the most brutal." Ganesh Ramsaran and his wife share three children. He said she has always been passionate for her kids and her artwork. But in the few months before her disappearance, he said she stopped painting, lost weight and her mood changed. "I was so proud of her because she was 190 pounds that Sunday the (Dec.) ninth. She hadn't been 190 pounds in years," Ramsaran said. "And you know, she changed unfortunately ... I'll leave it at that." Ramsaran said he'd stayed silent to avoid disturbing the ongoing police investigation. "The people that know us, I so appreciate their support. And everything that they've done, not just for me, but for the kids," he said. "The people that don't know us, that mudslinging and everything else, I have nothing to say. The truth always comes out." In a prepared note, Ramsaran addressed his wife of 13 years. "I don't think you ever knew how much we care for you, and how much your love and everything else -- " he read, before breaking down. The Chenango County Sheriff's Office has no updates on the case since they discovered Ramsaran's car and cell phone last month in two separate places in the town of Plymouth. Ganesh Ramsaran has offered his DNA, and to take a lie detector test if it would help the investigation. A website has been set up for Jennifer Ramsaran. Anyone with information is asked to call Chenango County Sheriff's at (607) 334-2000 and dial 1. Must See Video..Lost N Missing..
Re: On Dec. 11, 36-year-old Jennifer Ramsaran went missing after leaving for a shopping trip to Syracuse. Update: 2/26: Body has been found. Genesh Remy Ramsaran, husband, found Guilty of her murder. Receives 25 years to life. CHENANGO COUNTY, N.Y. -- People who know Jennifer Ramsaran are stunned that she's vanished. "The last thing in the world that you could ever imagine is going through something like this. And the kids and I, our families, all that we think and worry about is knowing that Jen is going to be fine, that she's going to be safe, that she's okay,” said Ganesh Remy Ramsaran, Jennifer Ramsaran's Husband. Family and friends of Ramsaran got together on Saturday in Norwich to pray for her safe return. The New Berlin native was last seen on December 11th. Deputies say the mother of three told her husband she was going to Destiny USA in Syracuse the day she disappeared. Police have found her cell phone and car. "You don't think the police have done evidence they need to do? If there's any type of evidence, the police have everything. They're doing everything they can. They've been incredible,” said Ramsaran. Now those close to Ramsaran are asking for the public's help. They released lanterns and handed out flyers with her picture Saturday and hope others will spread the word about her disappearance. "The majority of those that are missing and are located alive and well, it is because of the general public. Because they’ve made a recognition from the media about that person who is missing and being able to spot the person at that point and say, 'Wait a minute, she looks just like the young lady on the news this morning,’” said Cynthia Caron, LostNMissing President and Founder. Ramsaran's family hopes that if she's watching she comes home soon. The Chenango County Sheriff’s Office asks that anyone with information give them a call at (607)-337-1924. All calls will be kept confidential. NORWICH – Friends and family of Jennifer Ramsaran, a wife and mother of three who has been missing for more than two months, turned out to St. Bartholomew’s Parish Center on Saturday for a ceremonial tribute in her honor, and to spread the word of her disappearance in hopes of bringing her back home safely. The occasion, titled “Shining Hope,” was sponsored by LostNMissing, a national all-volunteer non-profit organization committed to bringing awareness to the public while helping to find missing loved ones. The event brought out people who are closest to Ramsaran, all of whom were willing to endure the blistering cold to show their support for the Ramsaran family, and all in high spirits that Mrs. Ramsaran is someplace out there, alive and well. Posters were distributed during the gathering which organizers encouraged be displayed throughout the community and beyond to spread the word of the missing Ramsaran to as many people as possible. Police found blood stains inside the minivan Jennifer Ramsaran was said to be using when the 36-year-old mother of three left her Chenango County home Dec. 11 and never returned, according to a woman assisting Ramsaran’s husband. Cynthia Caron, president of a New Hampshire-based organization called LostNMissing Inc., provided that detail to The Daily Star on Thursday, confirming she learned it from Ganesh “Remy” Ramsaran, who married Jennifer Ramsaran after the two met at the State University College at New Paltz. Ganesh Ramsaran said he did not personally see the blood in the vehicle, but was advised by investigators that a quantity of blood was in the van after it was located in Norwich by Jennifer Ramsaran’s father, Thomas Renz, while he was searching for his daughter. Chenango County Sheriff Ernest Cutting Jr. declined to confirm or deny the report that blood stains were found in the vehicle. He said the investigation is continuing. Ganesh Ramsaran told The Daily Star the blood could have come from nose bleeding by his wife and his son, both of whom have occasional allergic reactions. He said he could offer no information on the quantify of blood found by police. He said he still believes his wife will be found alive. Caron, responding to questions from The Daily Star, also said Ganesh Ramsaran admitted to police after his wife disappeared that he had a “one-time” sexual encounter with a woman who is a mutual friend of both Ganesh and Jennifer Ramsaran. She said the encounter was fueled by alcohol and both Ganesh Ramsaran and his female friend, a married woman with children, regretted it. “It was not an affair,” said Caron, who noted Ganesh Ramsaran has been tormented by what she called false rumors that he was having an extramarital affair. Caron also insisted that Jennifer Ramsaran never knew about the tryst her husband had with her close friend. Caron said she firmly believes Ganesh Ramsaran’s account that he had no involvement in his wife’s disappearance. She said she also firmly believes the alibi he provided police — that he went for a workout at a local YMCA while he believed his wife was headed to a Syracuse mall for Christmas shopping that day. Ganesh Ramsaran did not deny the extramarital tryst, and said he acknowledged it to investigators when he was questioned at length following his wife’s disappearance. He blamed “obsessed Internet stalkers” with spreading what he called unfounded rumors. “What does that have to do with anything,?” he said about the tryst. He did acknowledge that the information is an apparent factor in why his mother-in-law, Carol Renz, has had contact with a Facebook page, Help Find Jennifer Ramsaran, that has raised questions about his actions. He also said the only life insurance policy he has for himself and his wife “was taken out many, many years ago” through his employer, IBM, and that no changes have been made in recent years. Sheriff Cutting said police continue to await for Jennifer Ramsaran’s cellphone records. Ganesh Ramsaran located the cellphone using a computer application employing GPS technology. Police located the body of a woman today in the same Chenango County town where a cellphone belonging to missing mother of three Jennifer Ramsaran was found shortly after she disappeared last December, a source familiar with the investigation told The Daily Star. Chenango County District Attorney Joseph McBride said he could not comment on the development, and Sheriff Ernest Cutting Jr. was not immediately available for comment late tonight. Dental records are expected to be examined in an attempt to confirm the identity of the body. Kevin Ryan, a private investigator been assisting Jennifer Ramsaran's parents, Thomas and Carol Renz, said: "It's my understanding that a body has been found. If it is Jennifer's, it will bring closure to the family after three excruciating months." Ryan said the body was located in the town of Plymouth, not far from where Ramsaran's husband, Ganesh "Remy" Ramsaran, said he located his wife's phone Dec. 12, one day after he reported her missing. Thank you so much everyone. This has been a very difficult ordeal for the entire family of Jennifer Ramsaran as well as a number of my staff members, and of course myself. I will try and keep up with posts and I apologize if it may seem that you are neglecting a response from me or our Team to and/or to answer what questions that we may be allowed to answer. Please know I will catch up and I tremendously for all your prayers. It is not looking good and we are really just waiting for the official confirmation. Please pray for Jennifer's family. For now my responsibility is to care for my staff and for the children and spouse of Jennifer to be sure they are well, kept informed and support them through this horrible trauma. Yes, there are those of you who may believe you know what happened and you are entitled to your opinion, but nobody but a handful of people know the truth as to what led us to believe that Jennifer was in fact alive. Please do not be judgmental as we do not know what happened and our job is to continue to support the entire family that asks for our support. What we do know is that Jennifer's husband is in the a very difficult state of grief and the children are holding well. The youngest has not been told anything and will not until an official identification has been made. Remy spent some time with his mother and father in law at their home and the grief is tremendous. I again want to say that we ask everyone to please hold on to your opinions and instead...post prayers and well wishes. Remember...this is not about whatever happened prior to Jennifer's missing status....this is about the here and now and what has been found and what will be found and if this is Jennifer and if this was due to foul play...we stand strong and united in support of wanting justice. Until full information is disclosed and until the entire investigation is complete.....Do Unto Others. Our prayers are with all of them. Cynthia Caron, Pres-Founder of LostNMissing Inc.
A body found off Center Road in the town of Pharsalia on Tuesday has been positively identified as being that of Jennifer Renz Ramsaran, the 36-year-old Chenango County mother who was last seen alive on Dec. 11, Chenango Sheriff Ernest Cutting Jr. confirmed today. He said the positive identification was made by the Onondaga County Medical Examiner's Office, following an autopsy that was conducted Wednesday. The autopsy has not yet yielded the cause of death of the New Berlin woman, and it remains undetermined whether she was murdered or died accidentally or from natural causes, he noted. The results of toxicology tests are not yet complete, he also noted. Her husband, Ganesh "Remy" Ramsaran, who told investigators that he last saw his wife when she left to go Christmas shopping at a Syracuse mall that day, was notified by the sheriff's office today that it was his wife's body that was recovered in Pharsalia, Cutting said. Ganesh Ramsaran said in a statement: "I would like to thank all those who gave up many precious hours of their own lives to help look for Jennifer. To all of the friends and family of both mine and Jennifer's, I . I especially thank the businesses that stepped forward and offered their services..."
He thanked St. Batholomew's Church in Norwich, volunteers who aided in the search for his wife, as well as a business that assisted in printing missing-person flyers, among others. Cutting said Jennifer Ramsaran's parents, Thomas and Carol Renz, have also been notified that the body was that of their daughter. Ganesh Ramsaran has said that sheriff's department and State Police investigators spent four days combing his house for evidence that might shed light on his wife's disappearance. He said he was questioned extensively by investigators, and has cooperated with the investigation since its inception. A project manager for IBM who works at home, Ganesh Ramsaran said he also acknowledged in those interviews that he had a one-time tryst with a close friend of Jennifer Ramsaran who later became his running partner. Ganesh Ramsaran and his running partner participated in a road race in Binghamton last May to raise donations for the Epilepsy Association of Greater Rochester, according to a posting on Crowdrise.com, an online fundraising site. Cutting, citing investigatory reasons, said he could not comment on what led police to the body in Pharsalia on Tuesday. I am so sad she was found dead. I guess it's of some peace to her family. I wonder if the husband has been cleared or not. I don't know but something just does not make sense. The cause of Ramsaran’s death has not been released and police are still awaiting a toxicology report from the Onondaga County Medical Examiner’s Office. According to published reports, Jennifer’s body was found unclothed down an embankment, with no signs of trauma or personal belongings found. Ramsaran was reported missing in December 2012. Husband of Jennifer Ramsaran charged with murder in her death/Bails out of jail!! Genesh Remy Ramsaran / Courtesy: Chenango. Co. Sheriff's Dept. NEW BERLIN, CHENANGO CO. -- A New Berlin man is charged in the death of his wife. 38-year-old Genesh Remy Ramsaran, of Sheff Road, is charged with second degree murder in connection with the death of his wife, Jennifer Ramsaran, who had been missing for several months when her body was found in the Town of Pharsalia. Jennifer Ramsaran, 36, was reported missing in early December 2012 after she reportedly told her husband that she was going to Destiny USA to go shopping and did not return. Her cell phone was found in Plymouth and her car was located in Norwich shortly after her disappearance. Her body was found about two months later in the Town of Pharsalia. Genesh Ramsaran was arraigned in Chenango County Court and sent to the Chenango County Correctional Facility on $150,000 cash bail. He is scheduled to appear in the Town of New Berlin Court on May 23. NORWICH (AP) -- A 38-year-old central New York man charged with killing his wife last December has been released from jail after posting bail. 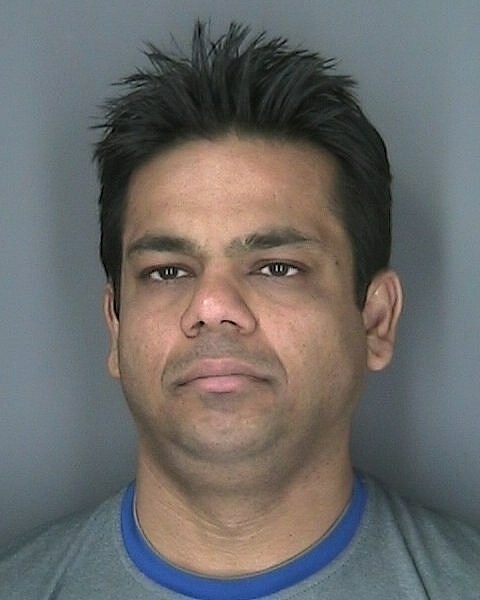 The Daily Star of Oneonta reports that Ganesh Ramsaran was released from Chenango County Jail Wednesday after he and relatives posted $300,000 worth of real estate for bail. Prosecutors had requested that he be held without bail after the 38-year-old IBM project manager was arrested last Friday and charged with second-degree murder. Authorities say he killed 36-year-old Jennifer Ramsaran last December. Her body was found in late February off a rural road in Pharsalia, 10 miles from the couple's home in New Berlin. Ramsaran told investigators he last saw his wife when she left to go Christmas shopping. His lawyer, James Chamberlain, says his client denies the charges. The motion alleged that there was a conflict of interest in the District Attorney’s Office. The motion called for the appointment of a special prosecutor from outside the D.A.’s Office. Ramsaran faces a 2nd Degree murder charge in connection with the death of his wife Jennifer in December of last year. Her body was identified Feb. 28 after she was found down an embankment in the Town of Pharsalia. Ganesh “Remy”Ramsaran to take stand again in murder trial. Former IBM manager Ganesh “Remy” Ramsaran is scheduled to resume his testimony today in Chenango County Court, where he is being prosecuted for the alleged murder of his wife, Jennifer, in December 2012. Ramsaran, 39, of South New Berlin, spent more than five hours on the witness stand inside the Norwich courthouse last week, adamantly denying he had any role in the disappearance and death of Jennifer Ramsaran, whose body was found off a remote road in Pharsalia on Feb. 26, 2013. The Onondaga County medical examiner’s office called her death a homicide but because the corpse had been exposed to the elements and wildlife, no specific manner of death was determined. Ramsaran, who worked from the family home on Sheff Road near Chenango Lake, spent part of his testimony telling jurors he prefers to watch Fox News and is a regular consumer of Chobani yogurt. (Chobani is produced at the company’s plant in nearby Columbus.) Who cares????? He said he, his wife, the couple’s three children and his parents all had a family outing at Brooks’ House of Bar-B-Q in Oneonta the weekend before his wife vanished on Dec. 11, 2012. He also said nothing happened out of the ordinary the day before, noting he had dozed off on the couch after watching “Monday Night Raw,” featuring professional wrestling. However, he did acknowledge he had a sexual tryst with his then-mistress, Eileen Sayles, his wife’s best friend, earlier in the day. When Ramsaran takes the stand today before the jury of nine men and three women, the direct examination by his attorney, Gil Garcia, will resume. When Garcia is completed with his examination of the defendant, Chenango County District Attorney Joseph McBride will have the opportunity to cross-examine him. Ramsaran took the stand in a surprise move after indicating earlier he was waiving his right to testify. Garcia has said he has no other defense witnesses. GUILTY: Jury convicts Ganesh Ramsaran of murdering his wife, Jennifer. NORWICH — Former IBM program manager Ganesh “Remy” Ramsaran was convicted Tuesday of second-degree murder in connection with the Dec. 11, 2012 killing of his wife, Jennifer, inside the couple’s home at 473 Sheff Road in South New Berlin. Clad in a crisp black suit, his thick, wavy hair neatly slicked back, Ramsaran grimaced and his eyes appeared to moisten when the Chenango County Court jury announced its verdict at 6:25 p.m. The verdict came at the end of a three-week trial, during which the defendant continued to maintain the last time he saw his wife was when she left the house that day to shop at a Syracuse mall. Within 30 seconds of the verdict being announced, Ramsaran, 39, was handcuffed by a corrections officer. Judge Frank Revoir Jr. remanded Ramsaran to Chenango County Jail without bail and said he would announce a sentencing date at a later time. A few benches behind him, Ramsaran’s parents sobbed. “Today, we got some justice for Jennifer,” Chenanago County District Attorney Joseph McBride declared outside the courtroom. His comment referenced the name of the support group that has formed to help the victim’s parents, Carol and Thomas Renz, and sister, Joann Buff, cope with the ordeal that has anguished the family since Ganesh Ramsaran reported his wife missing on Dec. 11, 2012. McBride said the long trail of social media comments and text messages sent by Ramsaran before and after his wife went missing helped to show he was motivated to get her out of the way so he could make a new life with his mistress — his wife’s best friend — and benefit financially by redeeming a $200,000 life insurance policy on Jennifer Ramsaran. The jury had begun deliberating a little bit after 3 p.m. When the nine men and three women on the panel were polled individually, each declared in a clear voice that Ramsaran was “guilty” as charged with murder. Ganesh Ramsaran, the South New Berlin computer expert convicted of killing his wife Jennifer while having an affair with her best friend, has been transferred to a maximum security prison known as “New York’s Siberia,” located in a remote northeast corner of the state. Ramsaran, 39, was moved to Clinton Correctional Facility in Dannemora for “program purposes,” said Patrick Bailey, a spokesman for the state Department of Correctional Services. When he was first sentenced on Dec. 1 by Chenango County Judge Frank Revoir Jr. to 25 years to life, Ramsaran was placed in Elmira Correctional Center, a prison that is one of the state system’s processing centers for incoming inmates. Gaining credit towards his sentence for the time he had served when he was was first locked in Chenango County Jail in 2013, Ramsaran, the father of three children, is eligible for parole on May 22, 2038, at which point he will be 63 years old. The rogue’s gallery of inmates who have been housed at Dannemora includes serial killer Joel Rifkin, who murdered 17 women, organized crime boss Charles “Lucky” Luciano, “Preppy Murderer” Robert Chambers, convicted of killing his girlfriend, Jennifer Levin, in Manhattan’s Central Park, and Ralph “Bucky” Phillips, convicted of shooting three state troopers after he escaped from jail. Just weeks after he was convicted in September of killing his wife in December 2012, Ramsaran was charged in November with offering a $100,000 bribe to a corrections officer if he helped him escape from the county jail in Norwich. A trial date for that case has not yet been set, officials said. Ramsaran has repeatedly denied having anything to do with his wife’s killing, insisting he last saw her when she left the couple’s home on Sheff Road to go Christmas shopping at a mall near Syracuse. Evidence assembled by District Attorney Joseph McBride and Chenango County Sheriff’s investigators punched holes in his alibi and documented what authorities called his obsessive involvement with a woman with whom he admitted having an affair.